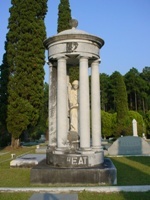 In 1930, Warren P. Ward, author of "Ward’s History of Coffee County," described the Douglas Cemetery as one of the most beautiful in South Georgia. Contributing to that beauty are Italian Cypress trees more than 50 feet tall and beautiful, historic monuments. The first burial in the Douglas City Cemetery was David H. Kirkland (1835-1865), owner of Kirkland Store. A walk through the historic area of the cemetery, located in the northeast corner, gives you a sense of pride and helps identify community pioneers. For plot and burial information, contact Cemetery Manager Henry Milhollin at (912) 393-4796. The cemetery is open from 8 a.m. until 8 p.m. daily. How much does a plot at the Douglas City Cemetery cost? What are the hours of the Douglas City Cemetery? What is the Garden of Innocence?